The New Funeral Concierge Program: Why It’s Creating New Opportunities & How to Promote it! A part of your role as a funeral director is getting the news out. It is so important to post the service information as soon as possible onto your funeral home’s website. For the most part, funeral directors first think about sending the obituary to the newspaper, and leave the posting of that obituary and service information on their website as an afterthought. As you read above, some of the first questions that come to a persons mind when they hear about the death is asking when and where the service is being held. If they turn to Google and find the obituary and service information on a newspapers website, rather than your website – you are missing out on thousands of dollars in revenues, branding and so much more. By posting the obituary and service information immediately to your website, you’ve now exponentially increased your chances of getting the search traffic from those curious people looking for answers. You’ve solved the When and Where. You’ve also helped the family with their grief, by creating a place online where they can direct people to, which eliminates having to repeat the same information, over and over again. Now, How do You Help Them With Where They are Going to Stay? The new Funeral Concierge is now built into the Book of Memories pages for all FrontRunner clients. This new feature acts as a resource directly on the funeral home website, through the deceased’s Book of Memories page, for attendees who need to travel to the service and more specifically to an unfamiliar city or town. With approximately 10% of funeral attendees travel from over 50 miles away to visit the service, wouldn’t it be nice if you could help take care of any travel accommodations for these grieving travelers without having to do anything? Well as a FrontRunner client, you now can. Something the family and their friends will appreciate. Some funeral directors see promoting travel to the service as a commercial function, however the real beneficiary is the family. It reduces pressure on the family when they get the inevitable “where should I stay” calls. It should also help your staff if they have to field those same calls. And as we have talked about, getting friends and family there to help celebrate the life is the ultimate goal. They have to travel anyway, and the Funeral Concierge Service just makes it easier by pre-populating the address and finding available hotels close to the service that they select. They don’t have to be familiar with the area and can search by hotel chain or number of stars. They can further filter the results once they see the availability. And all of this is done from YOUR website. Let’s look at some statistics! The chart to the right demonstrates that time is of the essence in getting the service information online. The average hotel booking is for 1.2 nights and the average nightly rate is $112.84. 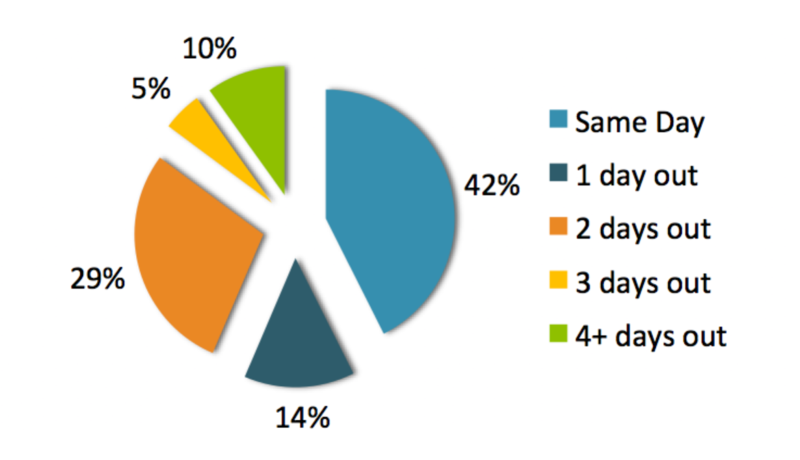 42% of the hotel bookings have been for arrival the same day as the reservation is made. This situation most likely occurs when the service information is posted the day before the first event. Another 43% make their bookings 1-2 days out. The longer lead time on bookings (more than 3 days out) are often for memorial services that are not as time critical, such as those that elect cremation and having the service at a later date at their church, synagogue or even in the home. Even if the service is happening quickly, people will still make plans at the last minute, so getting the Book of Memories and the service information updated as soon as possible will help get friends and family to town to celebrate the life with their loved ones, not to mention all of the other benefits from them getting to your website before a 3rd parties. So, How Can You Promote this New Feature on Your Website? Step 1: Add the service information to your website as soon as the family decides, even if there is no viewing and/or your funeral home doesn’t play a role in the actual service. 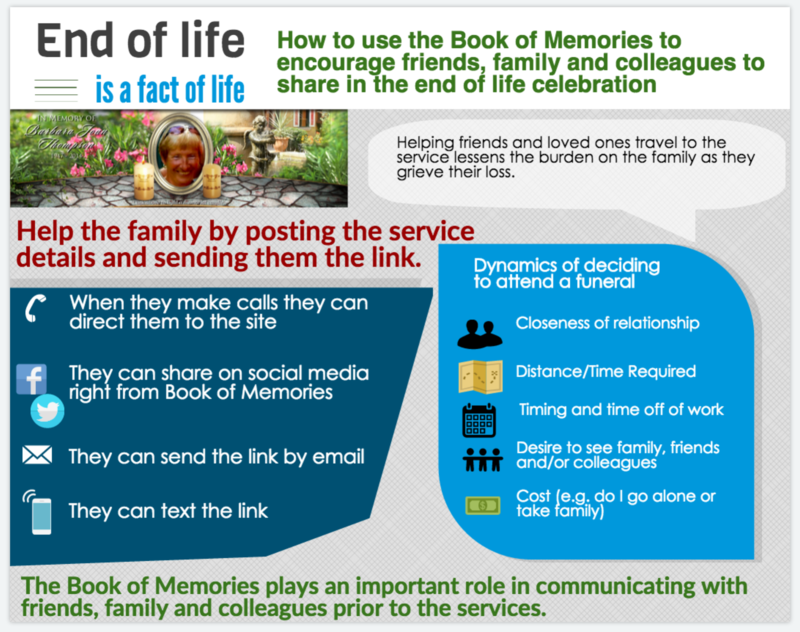 When information about the service is entered into the Book of Memories, friends, families and colleagues have the information needed to make a decision about attending the service. The family will be grateful and when the time comes, they will recommend your funeral home to others in need. Step 2: Once you have updated the information, we recommend that you send an email to the family with a subject line of: FOR THOSE TRAVELLING IN FROM OUT OF TOWN. Include a link to the Concierge Services page for their loved one and remind them that there is a place on that page to share. That page not only contains the trip planning information, but it also has all of the service information listed. Step 3: Train your staff on how to answer all calls or inquiries that come in about where they should stay when coming from out of town. Now, instead of recommending local hotels, your staff can tell them that they just need to visit the funeral home website to complete all of their booking needs. How’s that for helpful? A New Feature That’s Got a lot of Funeral Directors Talking! Everyone knows that there is precious little time between the death and the date of the service. As a funeral director, you have so much to do to prepare and make sure that everything runs smoothly. Rightfully so, the focus is on the family and meeting their needs during this tough time. It is also well known that having friends and family around during the days and weeks following a death is generally eases the grief for the family members. You may not think about it as your job to actively help get people get to the service, but you play a vital role. Whether or not you are hosting a viewing or a service in the funeral home, posting the obituary and service information on your website as soon as possible ensures that you answer their first three questions: When is the service? Where is the service? Where should I stay? Cheers to making your online presence a tool for your business, your families and your growth! Want to learn more about the new Funeral Concierge Program? Read How Booking Travel Plans is Made so Easy.